We Players is a company that specializes in site specific stagings of classic plays and stories, fully engaging the audience in the action. Such productions are a risky enterprise. Sometimes it works, and sometimes it falters. When it works, however, as in memorable stagings of “Macbeth” in the fog at Fort Point, or “Ondine,” at Sutro Baths, it is thrilling and spectacular. 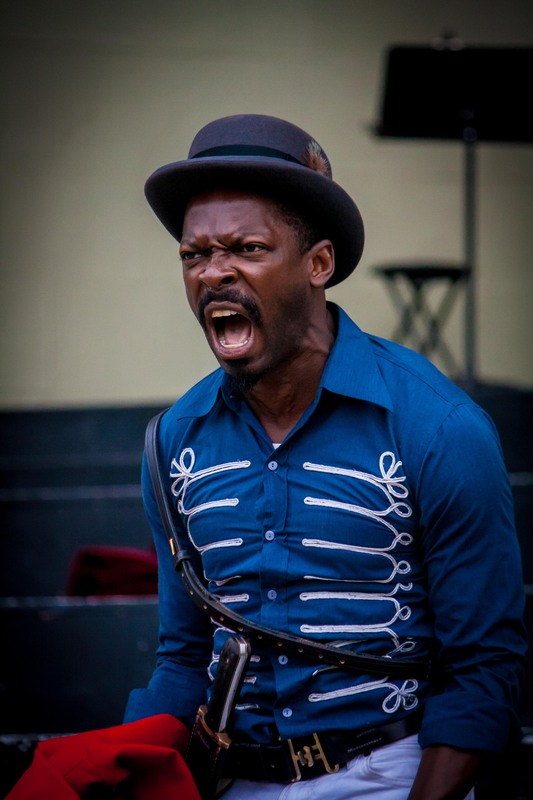 We can place “Caesar Maximus,” the company’s brilliantly-acted circus-like adaptation of Shakespeare’s “Julius Caesar,” staged in and around the Romanesque architecture of the Music Concourse in Golden Gate Park, solidly within the “thrilling and spectacular” category. It is difficult to imagine a more perfect Bay Area site for this production; one would have to travel to Rome to improve on it. As the actors and audience move among the majestic collanades of the Music Concourse, and pass various classically-styled sculptures while promenading across the lawn in Golden Gate park, imaginations are easily led to feel that we have been transported to ancient Rome. Directors/Adaptors Ava Roy and Nick Medina have imagined the story of Caesar’s rise and fall as a kind of “political circus” and brought the point home effectively by opening the story with a carnival (the Lupercala Festival) with jugglers, acrobats, soothsayers, and other circus performers. Through the crowd wanders Brutus, trying to awake our political consciousness, Marc Antony, campaigning for Julius Caesar, and two-faced Casca (one of the co-conspirators who will soon murder Caesar) acting as a reporter with notebook and pen to hand. Soon Caesar (a woman in this version) appears to thrill the crowd, and is confronted by a carnival soothsayer (a haunting Emiliy Stone) who warns her to “beware the Ides of March.” Moments later, as Caesar sweeps off, we hear the conspirators in the gathering shadows (it is sunset in Golden Gate Park) begin to consolidate their nefarious plan. From that moment, we are swept into the action as if picked up by a tornado, not to be let down until a couple of hours later, when we witness the denoument as the conspirators meet their final fates. Throughout all the circus action and interesting meanders through the park, this production never loses the line of the story, and as Shakespearean drama it succeeds admirably. The thread is never lost, and all of the actors speak the verse with a high degree of skill and perfect articulation. As Casca, Chris Steele comes on like a demented, two-faced Rex Reed covering politics instead of movie celebrities, and they create a memorable character. Joseph Schommer convincingly portrays Brutus as the ideal of Roman nobility. As the wolf-like Cassius, a co-conspirator, Hunter Scott MacNair is heart-breaking. And Rotimi Agabiaka, playing Marc Antony, delivers the famous funeral oration, as he should, with the force of an operatic aria. Speaking of opera, Charlie Gurke has composed a marvelous score, incorporating circus themes, to accompany the action, which he and a cohort of musicians execute with subtlety and grace. Libby Oberlin does a great deal in the small role of Caesar, making her both charmingly charismatic and frighteningly fascist. She shines like a sun and dies like a champion. The colorful, circus-inspired costumes designed by Brooke Jennings pull everything together visually and thematically without ever distracting from the story. This production is definitely worth celebrating. ‘Caesar Maximus’ continues at the Music Concourse in Golden Gate Park through September 30, 2018. For further information, click here. 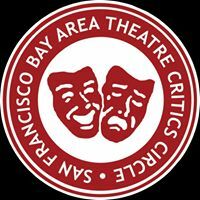 Posted in Reviews.Tagged Ava Roy, Caesar Maximus, Charles Kruger, Charlie Gurke, Chris Steele, Fort Point, Hunter Scott MacNair, Joseph Schommer, Libby Oberlin, Macbeth, Nick Medina, Ondine, Rotimi Agbabiaka, Sutro Baths, theatrestorm, We Players.